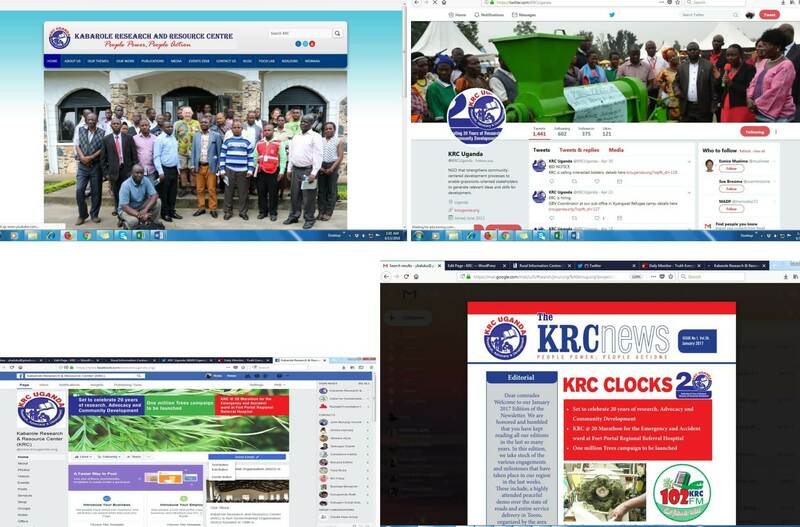 With a goal to facilitate rural development processes through generation, packaging, repacking and dissemination of timely and relevant information, the information, Research and communication unit of KRC is the flagship of the institution. KRC believes information is power and therefore, makes a strong case for research, building knowledge of what has worked and creating different options through which citizens get information. KRC researches therefore, are determined on their ability to contribute to knowledge and program design. This unit further supports the Governance and Policy advocacy (GAP)Unit, Food Security and Agrobusiness Development (FAGRIB) Unit and the Peace, conflict & Human Rights Unit to generate appropriate and reliable information, package and disseminate it to small holder farmers, their organizations and other appropriate users in a more user friendly way. The unit also facilitates the establishment of information sharing avenues at village level, Sub County, district and regional levels. Information sharing mechanisms used in the unit range from use of music, dance and drama, village meetings, dialogue meetings to SMS media, internet, YouTube, blogs, face book, radio, TV, fliers, e-newsletters, website and magazines.